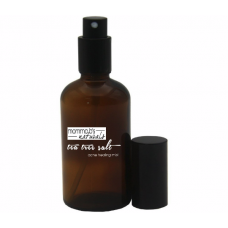 Tea Tree Toner for acne or oily skin. Cleans up bacteria and dirt in the pores and aloe vera gel calms and hydrates irritated skin, while absorbing excess oil from the skin. Ingredients: Aloe Vera Juice, Witch Hazel, Himalayan Sea Salt, Thyme Oil, Tea Tree Oil, Lavender Oil, Sodium Benzoate. Tea Tree Oil - heals existing acne + kills acne-causing bacteria. Lavender Oil - antiseptic and antibacterial, yet "easy" on the skin and doesn't cause excessive dryness.